Bearshark is a common Hunter class card from Knights of the Frozen Throne expansion. It is a three-mana 4/3 Beast minion that cannot be targeted by spells and Hero Powers. Typically, minions pay a hefty price for not being targetable: Soggoth the Slitherer, for example, costs nine mana but comes with only a 5/9 statline and Taunt. Tyrantus, on the other hand, takes your entire turn to play at ten mana, and Faerie Dragon with its 3/2 statline is easily removed. Bearshark hits a sweet spot for its ability: while there are multiple ways to remove it, a Hunter deck is often able to fight for the board in the early turns and prevent an easy trade. You get to play your one-drop first, and possibly follow that up with Crackling Razormaw or some other two-drop, and then play the Bearshark on turn three. 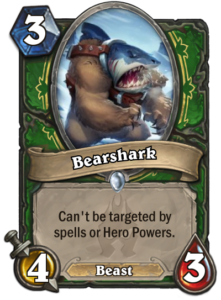 Should there be no immediate answer to Bearshark, Hunter can do great things with it with the help of two buff cards: Crackling Razormaw and Houndmaster. Spells cannot target Bearshark, but Battlecry effects can. 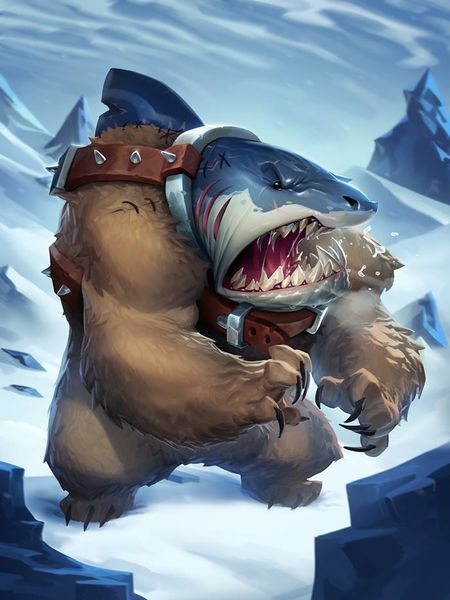 Bearshark with Windfury or a 6/5 Bearshark are great assets that can snowball completely out of control. Decks that take a while to get rolling, such as Jade Druid and Priest can just get overrun by Bearshark to a point where they cannot effectively get back into the game even if they manage to deal with it after a couple of turns. It cannot be Wrathed. It cannot be Swiped. It cannot even be killed with Ultimate Infestation. With the number of Druids and Priests on the ladder right now, Bearshark is a superstar. Bearshark is not invulnerable, however. It can be silenced with Spellbreaker or Kabal Songstealer (but not the spell Silence that is popular in some Priest builds). Mage can use a Medivh’s Valet to deal with it. Shaman can Devolve it. Nonetheless, answers to Bearshark are few and far between, and properly protected it can do a lot of damage. Compared to Rat Pack, Bearshark is way more effective in the current meta. 1/1 tokens from Rat Pack are often swept aside and Rat Pack does not threaten the opponent nearly as much as Bearshark does. Hunter cannot play a long game. The power of Deathstalker Rexxar is more in defending Midrange Hunter from even faster aggro decks than in taking control decks to the late game. Hunter also cannot be the fastest face deck: it cannot beat Murlocs and Pirates in a race. Therefore, Hunter needs to play cards that allow it to pressure slow decks and still be annoying for aggro decks to deal with. Bearshark fits this bill perfectly, and is a valuable addition to any Hunter deck right now, whether Face Hunter or Midrange Hunter.